People love online retailers because of easy accessibility and hassle-free experience. Over the years, online shopping stores have emerged as a better alternative to the crowded parking-scarce shopping malls. People love online retailers because of easy accessibility and hassle-free experience. Over the years, online shopping stores have emerged as a better alternative to the crowded parking-scarce shopping malls. In villages and semi-urban areas, it is the only channel to buy latest gizmos and latest gadgets. Cash-on-delivery system lent a sustainable lifeline to online stores. In addition, heavy discounting available at e-stores prompted the consumers to shop online. Presently, the size of e-commerce industry stands at $16 billion. Despite this astonishing figure, this size is just a small pie of overall retail industry which is worth $ 450 billion as industry professionals estimates. The online retail has been growing, so does the e-commerce industry in India. According to a survey by industry body Assocham, India's e-commerce market grew at a staggering 88 per cent in 2013. Measuring the potential that this multiple billion dollar retail industry retains, the competition is growing fierce among online and offline retailers. “The problem is everybody is trying to be next ‘flipkart’ and ‘snapdeal’ without defining their objectives right, hence the market is getting crowded with few genuine players,” says Bhawna Agrawal, Chief Executive Officer, Luxury Retail. Now, the question is whether the charm of brick and mortar rapidly evaporating, and virtual business will soon take over real? Leading e-commerce portal Snapdeal says that its traffic drops by 10-12 percent during weekends. Other online shopping sites like Myntra, Amazon, eBay, Caratlane, Lenskart, Flipkart etc, have indicated that most number of orders between 12 noon and 4 pm on working days. More than 50% of sales happen on Tuesdays, Wednesdays and Thursdays. The traffic of these sites get decreased over the weekends when customers go to brick-and-mortar shops or malls for their relaxation. So the argument goes in favour of brick and mortar as its still prevails over online peers. 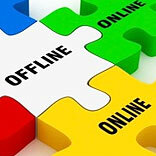 Owing to people’s busy schedule, on weekdays, online is becoming their preference. Experience of offline store is difficult to repeat in online world. However, with growing popularity of online channel can’t be ignored. Hence adopting ‘Hybrid’ model could be crucial to success. It has become a compulsion for retailers to present on multiple channels in pursuits of staying ahead in competition. Technology and emerging role of social media are two game changer tools for hybrid model. Speaking on the issue, Krsna Mehta, Director, India Circus Retail said, “Through people crape social media but in our case it works quite wonderfully.” Our product range starts quite reasonably and gets high quite dramatically, we are actively promoting range through Facebook and other platforms, he added. Godrej Interio has started e-commerce operations six years back, but it did not worked out for them and they have to close it down. Now they are relying on social media promotion as the part of product promotion strategy. Subodh Mehta indicated they will soon restart e-commerce operations through market place model. From the beginning retailers should map their pin codes rightly and offer your services accordingly. Moreover, look and feel of website is equally important along with easy navigation and logistics operations, Rajpal added. Analysts have highlighted Infrastructure has not grown alike to countries China, India is failed to match up that standards. Not only infrastructure, but investment is also not taking place alike to other countries especially in brick and mortar retail. However, he expressed hope that it is certain phase of industry as this industry is still in beginning phase, and soon industry will get stabilized.